On numerous occasions, Manntech’s expert design, engineering and manufacturing teams have come together to develop specialised Building Maintenance Units (BMUs) tailored to the needs of specific building projects, with capabilities and functionality which are not often found in standard ranges of building access equipment. Often, this has meant developing technology beyond what other providers in the industry were able to offer and pushing the boundaries of what had been considered possible. Rather than forcing standard machines on to unique buildings for an imperfect solution which falls short of the coverage required to effectively maintain unique structures, Manntech have repeatedly shown their ability to deliver innovative facade access solutions which achieve a more integrated and comprehensive building access system to meet the practical and aesthetic challenges presented by complex buildings. Elite Residence in Dubai is a building of impressive scale; a supertall skyscraper rising 380 metres and 87 floors above the Dubai Marina makes it the world’s fourth tallest residential building. Clearly, a building of this scale required an access solution capable of providing the required coverage and servicing to all of the facade surfaces. The challenge, however, was that this level of coverage needed to be achieved using just one Building Maintenance Unit (BMU) situated in a relatively small, predesignated space at the top of the structure. Manntech developed a tailor-made BMU which provides a very compact form when not in use in order to park unobtrusively within the limited space available. To deliver comprehensive access to the whole building envelope, the BMU is equipped with a four section, telescopic jib arm which uses a precise control system to launch from four designated open sections at the top of the building and deliver an outreach of up to 26.5 metres. Petronas Towers in Kuala Lumpur remains one of the most instantly recognisable buildings in the world and its twin towers are still hold the records for the tallest building of this type and the highest double decker skybridge. Both the scale and the forms of this iconic building required facade access solutions to match the vision and innovation of the architects. 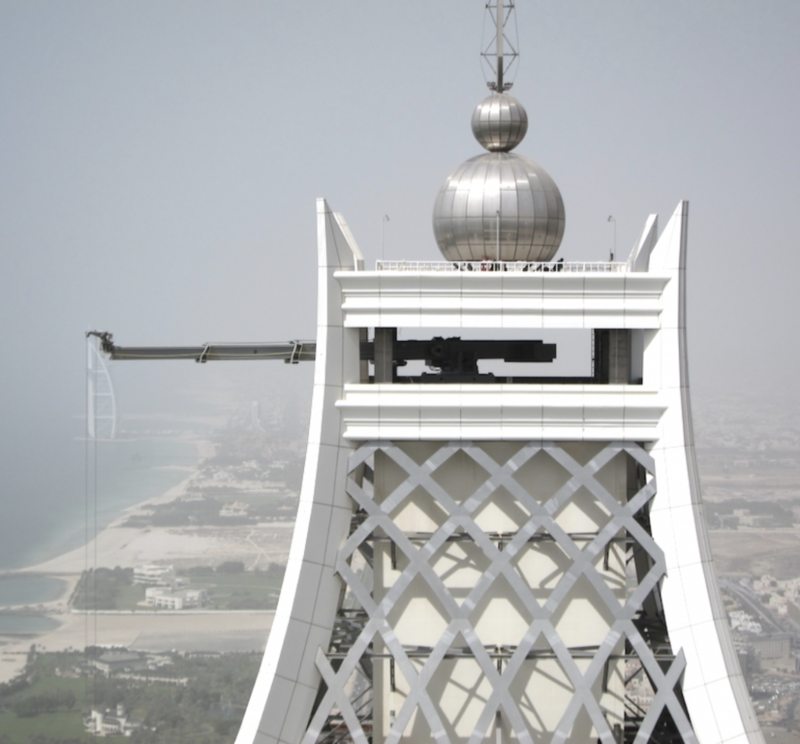 Among the adaptations and innovations required in developing the building access system for this ground-breaking supertall building were a new type of hoist unit capable of reaching the height required by what was the tallest building in the world, BMUs in each tower which rotate on turntables in order to be concealed when not in use, and the first ever use of the soft rope system on a building of this scale. Sozawe Groningen in Groningen, Netherlands, also known as The SoZaWe, provides citizens with a hub for information and guidance on work and social affairs with a unique transparent design intended to provide an open, welcoming atmosphere. The defining transparent nature of the building called for an innovative solution capable of providing practical, unobtrusive faced access for maintenance of both the interior and exterior facade surfaces. The custom system Manntech delivered includes two suspended ‘spider’ cranes for access to the interior of the facade, both with multiple pivot points on the arms to ensure full coverage of all glass panels. In addition, the interior facade access system provides precision movements via the use of pre-programed positioning. Without a suitable roof area for a traditional BMU, the exterior of the facade is serviced instead by a climbing roofcar.